SANTA CLARA, CA – 2013 graduate Jared Brownridge finished his high school career with 1,608 points, the second highest in school history. Thursday night, Brownridge made more history, but at the NCAA level. 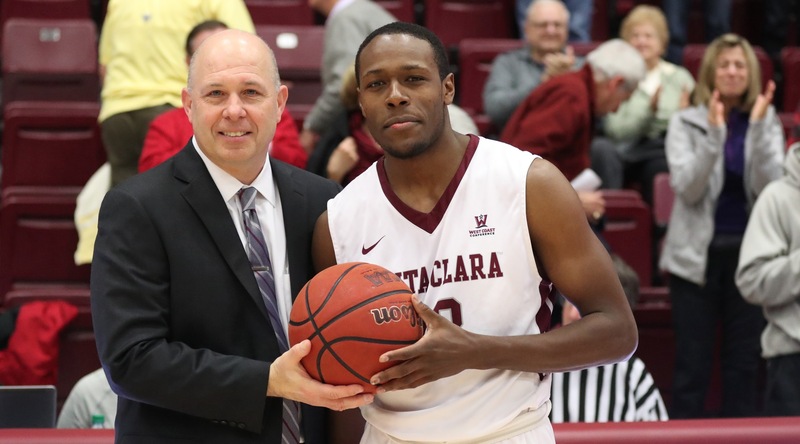 With a layup in the second half of Santa Clara’s 70-42 win over Portland, Brownridge eclipsed the 2,000-point career scoring mark. Afterwards, first-year head coach Herb Sendek presented Brownridge with the game ball. 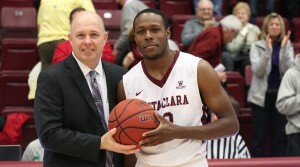 “It feels great to reach a milestone,” Brownridge told Santa Clara radio in a postgame interview. “I remember when I got to 1,000 points, and it’s weird to see things come around to 2,000. I’ve put in a lot of work at Santa Clara to get there.” Brownridge scored only eight points in the game, but said that the team win was more important than the individual accolade. Brownridge became only the second player in school history to reach 2,000 points and the 11th player in West Coast Conference to surpass that mark. Among Brownridge’s other notables, he is fourth in the NCAA among active career scoring leaders and is in the top 80 in three-point field goals. Brownridge played at Waubonsie from 2010 to 2013, where he holds records for most three-point fields goals in a game (8) and a career (203). He helped lead the Warriors to their last 20-win season in 2013.